Raccoons are found almost everywhere in North America. They like to live near creeks, ponds or rivers where food is plentiful. Raccoons prefer to make their dens in hollows in standing trees but have also been known to use underground burrows. Their adaptability to the loss of habitat brought on by human development has led them to use abandoned buildings and vehicles as denning sites as well. 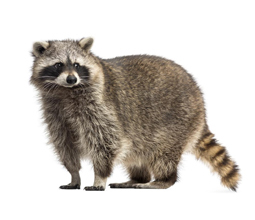 Raccoons are omnivores and their diet includes frogs, crayfish, fish, birds, eggs, fruits, nuts, grains, small mammals and insects. If you encounter a raccoon, especially during the day, do not approach or harass the animal. Animals, especially raccoons, have a fight-or-flight instinct and can be quite dangerous. Leave the animal alone. Call Shumaker’s animal control 443-854-8072 and we will come and remove the animals, then seal up the opening permanently. Raccoons commonly hibernate and raise their young in chimneys. If you suspect there is a raccoon in your chimney, do not bother it or it will become an angry raccoon. They cause serious problems for property, pets, and people… and the raccoon population continues to skyrocket making these issues hard to ignore. Female raccoons are territorial (stick to the same area) and only socialize with adult males during mating season. Depending on weather, they can mate any time between December and June, but the preferred time is February.